« The difference between cats and dogs. My mother cried when she discovered I’d stopped eating meat. Even by Texas standards, that’s sort of an extreme reaction. However, my particular mother is a cattle rancher, as was her mother. She was convinced that I’d never be willing to come home and help on the place. She morned the idea that I wouldn’t eat her cooking anymore. That said, I am not actually a vegetarian. Growing up in the deepest ventricles of cattle country, I was a born carnivore. I love meat. Still do. In grad school at Texas A&M, though I spent a lot of time around the poultry industry. I taught labs on poultry slaughter and the egg industry. I took classes as an undergrad in meat processing. Have you ever smelt the inside of a layer house? Though I do believe that my digestive tract and teeth are meant to tear into some tasty tasty flesh, I don’t believe that I should sacrifice my ethics to do so. Food animals don’t deserve feed lots, high cage density, filth, or fear. I want to eat them. I don’t want to be responsible for their torture. For the last couple of years, I’ve stopped eating any industry raised meat. Okay okay…. that was me you saw at the Salt Lick, (http://www.saltlickbbq.com/) but I felt really guilty after! Usually though, I only eat game, wild caught seafood, or ethically raised meat. Free range, grass fed meat is hard to come by and is fairly expensive. Then it struck me: Mom raises cattle. I convinced her to let a couple of calves grow out with the herd and then have them processed. 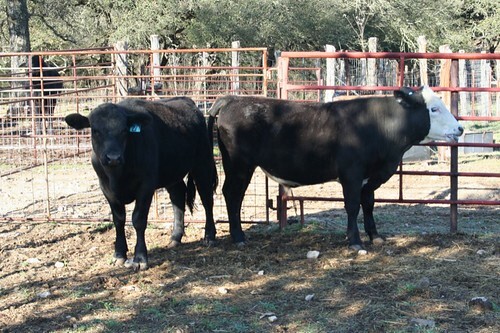 I picked two bull calves, earmarked 26 & 27, and had them castrated. They’ve been happily grazing away on 250 acres in Oakalla, Tx, with a little bit of grain and range cubes thrown in. My boyfriend recently renamed them Lunch and Dinner. Last week, we delivered them to Hibler’s deer processing in San Saba. Stay tuned for beef recipes. This entry was posted on March 25, 2008 at 12:22 am and is filed under Food. You can follow any responses to this entry through the RSS 2.0 feed. You can leave a response, or trackback from your own site. Word, G. Hook me up with some of the sweet tasty beef should you have extras. P.S. Huh huh…you said boyfriend. You’re gross.